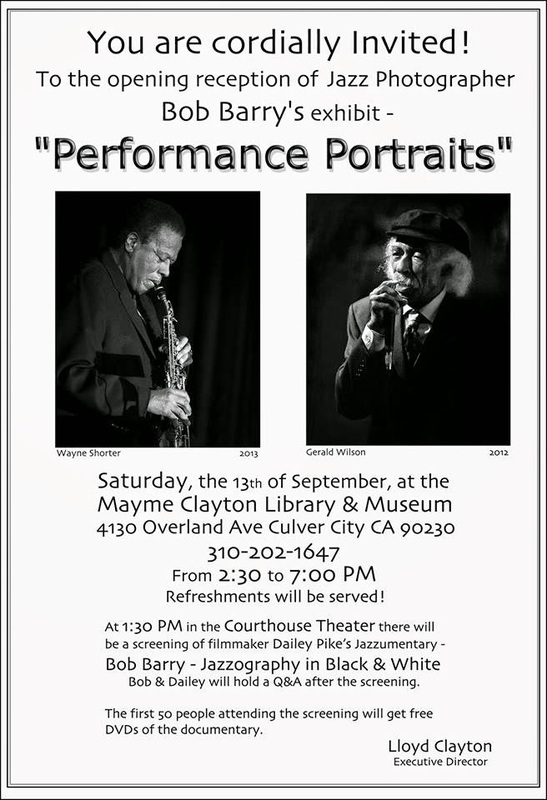 Jazz Station - Arnaldo DeSouteiro's Blog (Jazz, Bossa & Beyond): Bob Barry's exhibition "Performance Portraits"
"A brief reminder that the reception for my photo exhibit at the Mayme Clayton Library and Museum will be this coming Saturday (13th). There will be a screening of Dailey Pike's "Jazzumentary", Bob Barry - Jazzography in Black & White at 1:30, followed by a Q&A session with Bob & Dailey and the reception starts at 2:30 and will run till 7 PM. Refreshments will be served and Music provide for the reception by two wonderful pianists, John Campbell and Dan Marschak. I am looking forward to seeing you all and sharing with you a great deal of my newest work. In total there will be 72 images being displayed for this exhibit."